Today went according to plan, but not design. Woke up with the tent fly drenched. Not a surprise, we slept in a freaking jungle. I am happy to report that everything inside the tent was condensation-free. Yay REI Quarter-Dome. I asked Frank ( www.krad-vagabunden.de ) about breakfast possibilities and he suggested running out to the supermarket quickly before they started charging tolls to get back down the road to the ruins (and the campground). Neither of us were thrilled with that idea since we were still breaking camp and simply didn’t want to deal. Instead we decided to hit the park on sugary treats and grab food there if we could. Yeah, not a brilliant idea, but the ruins were only 3k away. Side note: I’ll add details about tickets, etc. at the end. They thought we were silly for taking our bikes there since it was so close and our stuff would be safer at the campground, but as we weren’t staying another night it seemed wrong to leave our stuff there until sometime after noon. Plus it was hot, muggy, and we didn’t want to walk 3k there and 3k back. Got there early enough (8:30) to get one of the 20 or so actual parking spots. No, really… thousands of visitors a day; roughly 20 parking spots. With no food stalls in sight we grabbed tickets and a bottle of water and hit the entrance. We’d love to just walk around these places with our CamelBaks but we wear our Wolfman Ranier tank bags as backpacks (you can get backpack straps for it) because we’re not about to leave them on the bike. As soon as we went up the first steps it became pretty clear to us why the folks we met from Monterrey said it was more impressive to them than the Great Pyramids. It’s simply impressive. The temples rise dramatically from the jungle floor. 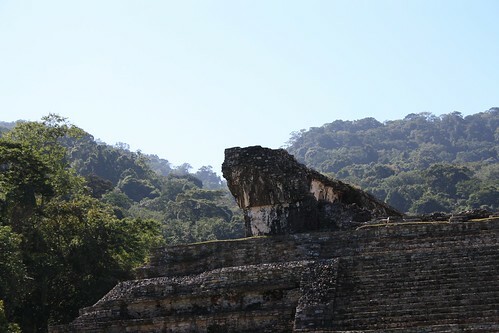 The main ones are in really good shape, considering they’re ancient structures in the middle of a jungle. And, the place is huge. There are plenty to walk up the steps of to the point that Dachary said something to the effect of “tell me we don’t have to go up that one too.” It wasn’t that we were going up every one. It was that it was 92 degrees F in the shade and the humidity was way up there. Going through them became work, but not a “lets do these so we can go” (Dachary) work like Monte Alban. It was more of a difficult task that is guaranteed to give you something good at the end. The difficult task was compounded by the steps. Holy crap the steps. Steps everywhere. The Mayans who lived here must have had incredible calves. Unfortunately, Palenque is hard to photograph and do it any sort of justice. It’s even harder to photograph when all you want to do is sit in the shade and drink more water. 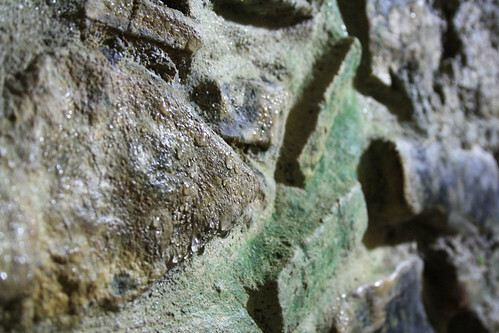 My only lament about Palenque is the lack of visible carvings or other artistic details. There are some, but it’s essentially all wonder of the architectural variety. However, we both agree that Palenque is totally worth doing. 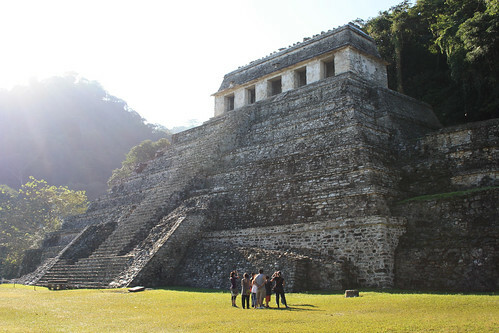 We enjoyed El Tajin, were disappointed by Monte Alban and Palenque was a whole new scale of awesome. If you’re on the edge about seeing it, see it. It’s worth it. I think that if we could only have seen one ruin in Mexico, Palenque would be the one we’d want to see. As we made our way back to the entrance Dachary noted that she’d seen a restaurant and suggested that even if it was stupid park prices we should go there, sit for a while, and refuel before taking off. I agreed heartily, and once we sat I swear it took at least half an hour, one Coke, one Fresca, and 3/4 of liter of water to get our core temperatures back to something resembling normal. Neither of us wanted to touch the bikes, but eventually we had to, and we knew that we’d be cutting the day short in Tenosique (sixty miles away) because it’s the last place with a hotel between here and Guatemala, and it’ll take a full day to make it the 200 miles from there, across the border, and on to Flores Guatemala (the next place with gas) and while it’s definitely warm enough to camp, neither of us were feeling it. Thirty miles later and I was fighting to stay awake. There were sneaky potholes and unmarked topes combined with a 80kph speed limit. Dachary confirmed that she was feeling it too. Just wiped out. The heat was doing us in. So, when we got stopped at a police checkpoint at the edge of Tenosique I asked the cops where I could find an “economical” hotel. They pointed to the sign for the California Auto Hotel right beside them and suggested that it was the best one around. Giving comments (partially in mime) about the alternatives. There was of course, the obligatory air guitar from one of the cops at the mention of the Hotel California. :) So far, Mexican cops have been pretty cool. Side note: They’re just writing down names and plates of everyone. It’s probably something to do with the border crossing having opened up at El Ceibo. We pulled in. $450 pesos… pricy, but neither of us was doing well and I deemed it more important to get naked and into a cold shower than to find a better price. We were very happliy surprised to find it had Air Conditioning!!! Wi-fi with decent download speeds! And actual Hot Water… not that we used much of that. Did I mention we were wiped out? Absolutely wiped. The temperatures were hot today, it was humid and the 60 miles from Palenque to Tenosique were the hardest 60 miles of the trip so far. The visit to Palenque probably started the dehydration and overheating, and I don’t think we really recovered from that fully before setting out on the road. It’s the only real explanation for why this day was so much harder than any of the other days we’ve done, when we only rode for a few hours and didn’t cover much ground. Feeling headachy and beat, we tried getting room service but that was not to be (again willing to pay extra to not have to move), so we suited up (in still disgustingly sweaty things) and went for the bikes, but the hotel lady caught us and told us that there was a place to eat just outside the entrance. We went back, took off icky gear and had a great dinner at a nameless place made excellent by the big woman with a huge smile who runs the place. You could not ask for someone more accommodating to people with a crap grasp of the language. Dachary ordered empanadas, but we were still hungry, so I ordered carne asada. The former was simple and decent, the latter was simple and excellent. Just beef, salt, pepper, some time over flames, and a lime to squeeze on it. That, plus a heavy dose of ibuprofen, and air conditioning was exactly what the doctor ordered. So, now, naked, showered, and now with pretty much every article of clothing we own washed and hung to dry somewhere in the room I write to you. * Tour guides are trivial to find by the ticket booth. * You can’t beat the tourists to Palenque, but you can get a head start on the sun. They open at 8. * Bring your umbrella. Really. To block the sun. * When you find the Baños go left, then down the really steep stairs to the right of the temple. If you go right at them you’ll end up having to come up the really steep stairs. * maybe buy some Gatorade by the entrance. * Do not rush it. It is huge and the heat is oppressive. Stop regularly in the shade.